Effective teaching and learning is about being present; being in the moment. Too often I am aware of teachers who are not being in the moment. These actions and others like them send one simple message to your students: That you don’t care. Perhaps the reason you don’t care is because you are not being in the moment, you are elsewhere. The knock on effect of this is probably poor behaviour from your students, they are now, not in the moment either because they don’t want to be and they are certainly not learning. If this is hitting home and you want to reinvigorate the teaching and learning in your classroom, then begin by turning off your email for a day. Forget about what you are doing next lesson or tomorrow. Get up from your desk and step away from the white board. For the whole day, lesson by lesson, inside your classroom focus on the here and now. Your students will appreciate the attention, real learning will take place and you will feel so much better for freeing yourself of other matters, particularly your email inbox. 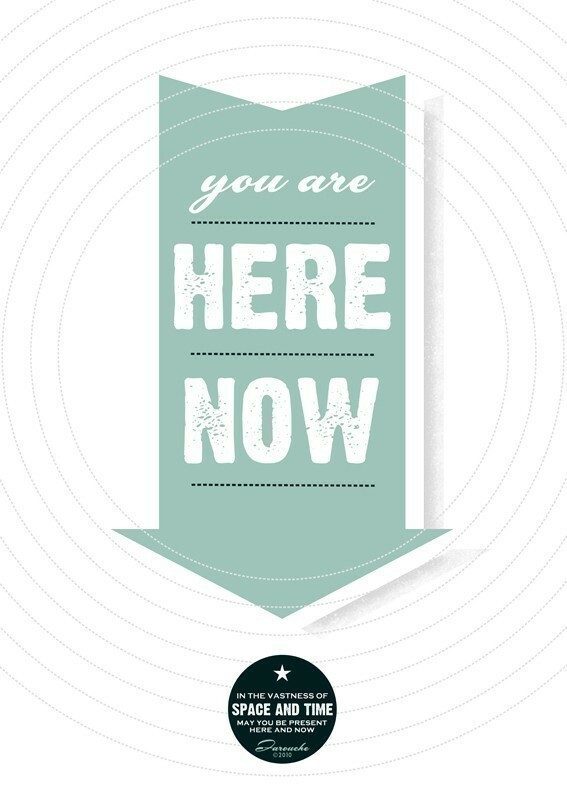 Remember “you are here now”! Image “you are here now” by farouche and available to buy on etsy. I'm all for having no teacher's desk at all. Especially in an ICT room. I can't see any reason why a teacher needs to be sitting in an ICT lesson other than to take the register. Great post James! It all sounds so simple – Be interested, look interested and the pupils will be too! It's such a shame when teachers turn off. It's not always entirely their fault in some cases which is sad! Schools and leaders must support everybody and after training for all and expose teachers to outstandingness! Yes, that is very true. Only works though if the teacher is willing to accept the support / acknowledge what “outstanding” looks like. I think it's very important that teachers who are new to the profession realise that it is important to be humble, acknowledge their limitations and strive to set themselves on a path of continual personal development. We all have something to learn. If we are invigorated by our own learning experiences then I believe that we take that vigour into our classrooms and instill the same enthusiasm in our students. It's a cyclical process! It's funny you should say that but I recently turned the “teacher's desk” in my room around so it was butted directly against the wall, looking away from the students. This was in part to give me more space in the room for activities and teaching but to also ensure I (and others who teach in my room) avoid the temptation to sit at it. I try to stay in the 'learning zone' at all times, often sitting next to individual students helping them with their work. I personally believe that teaching from the front of the classroom is a dying art any way – I see myself more often than not as 'facilitator' (rather than teacher) guiding my students on their learning journey. This is part of the reason I do embrace quite a lot of web2.0 technologies such as blogging. I want my students to become self critical, documenting their learning journey, researching, reflecting, planning, producing, peer and self assessing rather than simply looking to me for the answers. This has led to me finding my position in the classroom far more comfortable when I am sat amongst the students rather than sat in front of them. These unfortunate distractions happen in every building including my own. Although not perfect at all times, I do try to be “in the moment” with my students and lessons. I find it interesting that you correlated the lack of teacher engagement within a lesson to student behavior issues. I completely agree. Not only are the students disengaged, class management issues erupt and the realization that their teacher doesn't care is hard to erase from their minds. Also, have you ever taken a NWP course? Your responses, especially to my blog, remind me of that philosophy in response. I think a teacher's desk is still very important because it gives you a base in the classroom at which to do your planning & marking (outside lesson time of course). Marking books hunched over a student's desk on an undersized desk is a surefire recipe for back problems! However I agree that during lessons the place for you to be is out and about among the students. Yes, very true. I would not want to be without my desk. When I am not teaching, it is my hub, set up just the way that I like it. But it is the last place you will find me when I'm teaching a class, particularly as I use my MacBook Pro remote to control presentations during lessons. This frees me up to move around the room during the parts of lessons where I am delivering to the students. Yes, when you lose a class it is very hard to get them back. While it is hard to be in the moment with every class, every lesson, I believe it is an attitude to learning that you are striving to create within your classroom. Those first few weeks at the beginning of the school year are key. I don't sit down for a minute. I greet my students at the door, picking up uniform issues, smiling at them, welcoming them in. With my new classes I try to use activities that allow me to get in amongst them so that I can get to know them. And I build in as many “mini-plenary” sessions as possible so I can learn names and listen to what they have got to say. I guess I'm saying that it's about relationships. If your relationship with your students is good then you will have very few problems with them. Not being in the moment can be a catalyst for damaging your relationship with your students and can switch off whole classes. As for NWP. Not even sure I know what it is? I will have to look it up! Totally agree James. It's not sufficient for teachers to do a 'send and thou shalt receive' exposition, set some comprehension tasks and then sit back at the desk whilst checking emails, planning lessons etc. In the new building we move into in September there are no teachers desks in classrooms. There is a tiny workstation with a computer point and no space for anything else. Hopefully this will enable teachers to fully engage and facilitate the learning within their classroom. Time has been spent designing staff workrooms so you can get distracted/be productive away from your teaching. It will be very interesting to see how this will impact on my teaching and that of others in September. “invest in them and they will invest in you” – nicely expressed Jamie. I think I like that more than “being in the moment”. Teaching is an investment. It's an emotional investment, it's a people investment, it's a time investment. And it should be. Education is worth doing. And like anything worth doing, it should be given the time and effort it deserves. There are not too many teachers like I describe at my school either. But for me even one teacher like that is too many. I often say to trainees, “if you're in this for the money then you have picked the wrong profession. If you're in this because you love learning and you like children then you have come to right place”. Teaching is much more than a job, it's an investment of your mind, body and soul. That sounds like an interesting set up. Unfortunately, we have very limited space outside of our classrooms. My desk therefore, while I have repositioned it so as not to be part of the learning zone during my lessons, is important to me as a place to sit and work when I am not teaching. Please let me know how it goes in September. I would be very interested to see a picture or two of the staff workrooms and how they have been set up.